The number of incredible stories to emanate out of UFC 199 on Saturday in Inglewood, Calif., was, well, incredible. On one night, Michael Bisping won the middleweight championship, the rematch between Conor McGregor and Nate Diaz was set, it was announced that Brock Lesnar would return to the UFC and that Fedor Emelianenko would compete on a show that will be live-streamed on UFC Fight Pass. But none of it seemed to matter too much late Saturday and into Sunday. Instead, the sports world was talking about a reporter. 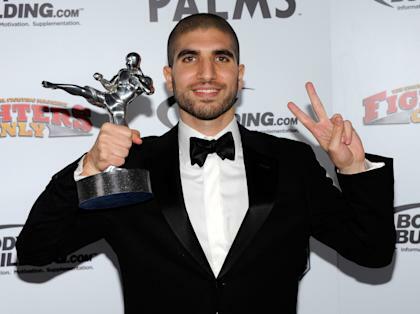 The UFC had decided to ban MMAFighting's Ariel Helwani, as well as two of his colleagues, E. Casey Lyden and Esther Lin. Helwani’s sin, apparently, was accurately reporting Lesnar’s return and the making of the McGregor-Diaz rematch before the UFC was able to announce the news during its pay-per view broadcast. UFC president Dana White failed to return messages seeking comment. After initially declining to speak, an emotional Helwani spoke for about 15 minutes Sunday to Yahoo Sports. “I was brought to the back by UFC [public relations] and told by Dana White that I had to leave the arena,” said Helwani, who said it happened just prior to the main event. “Dana mentioned that from what I recalled that Brock Lesnar was upset the news was released early and that this could have ruined their deal. “He repeatedly said, ‘Go cover Bellator. We don’t want you here.’ … I said, ‘What did I do wrong?’ He said, ‘You’re too negative.’ "
Helwani said he had confirmed both reports with two sources. He said he held no ill will toward White or UFC CEO Lorenzo Fertitta, but said he did not regret reporting the news. Helwani, who used to work part-time for Fox as part of its UFC coverage team, was fired from that job earlier this year, reportedly because of an interview with a UFC fighter where the fighter praised the concept of free agency. He said UFC officials suspect he has a “mole,” who is giving him information. By looking at it, it appears that UFC executives are upset Helwani upstaged their announcements and decided to take the most egregious action they could. It’s a short-sighted decision that does nothing to help the UFC in its efforts to sell tickets and pay-per-views to its shows. A media credential is a privilege, not a right, and none of us “deserve” a credential. Nor is this, as some have suggested, a First Amendment violation. Helwani’s free speech is not being violated. He can, and undoubtedly will, continue to say and write what he wants. Instead, this is a case of White and Fertitta being men who are extraordinarily passionate about controlling every last detail of the way their product is presented. They obsess over the smallest of things, like their choice last year to change the font on the graphics they use for television. As a result, they’re failing to see the bigger picture in this case. They’re so immersed in the minute details that they are ignoring the obvious. I have known Helwani for about seven or eight years. I’ve found him to be ethical, trustworthy and scrupulously honest. He has an enormous love for three things: His family, journalism and MMA. Helwani’s reporting and commentary have only helped to make the sport’s fan base even more rabid. He has an online talk show on Mondays, “The MMA Hour,” that often goes four hours. He has all the major figures in the sport on his show. Fans eat it up. And his work on that one show alone keeps MMAFighting.com filled with stories for the rest of the week. Helwani is the rare journalist, perhaps the only journalist, who gets an ovation from the fans when he’s shown on camera at a news conference. The day before UFC 196 in March, the UFC held a news conference to announce its summer fights. A large number of fans were in the seats at the MGM Grand to watch, and reporters were on the floor. When Helwani stood to ask a question, fans cheered him. He is unique among all sports reporters I’m aware of in the connection he has with fans. He’s mobbed for autographs and photos while at events. And you want to ban that guy? The decision to ban Helwani is egregiously wrong, though it’s hardly the first time the UFC has been at odds with the media that covers it. Part of the problem that exists for reporters covering the UFC is that White does not allow a large majority of his employees speak to the media. All of the information comes through him and so media flock to White to try to get it. He’s outrageously busy and in demand so often, he’s hard to get. And the media is often the last thing he cares about. If he allowed, say, matchmakers Joe Silva and Sean Shelby to talk to the media, it would be beneficial to all involved. Silva and Shelby are as knowledgeable, or more, about the sport than anyone alive. And they’re smart, insightful men. But reporters can’t go to them due to UFC policy. The UFC seriously needs to consider its relationship with the media. And that should start by reinstating Helwani as soon as possible. There are many good stories that the fans, who watch the UFC and consume the media reports about it, are interested in hearing. Far better to talk about Bisping’s unexpected championship win and what to expect from Lesnar in his most-recent go-round than why an earnest reporter got banned for life for doing what he’s paid to do.